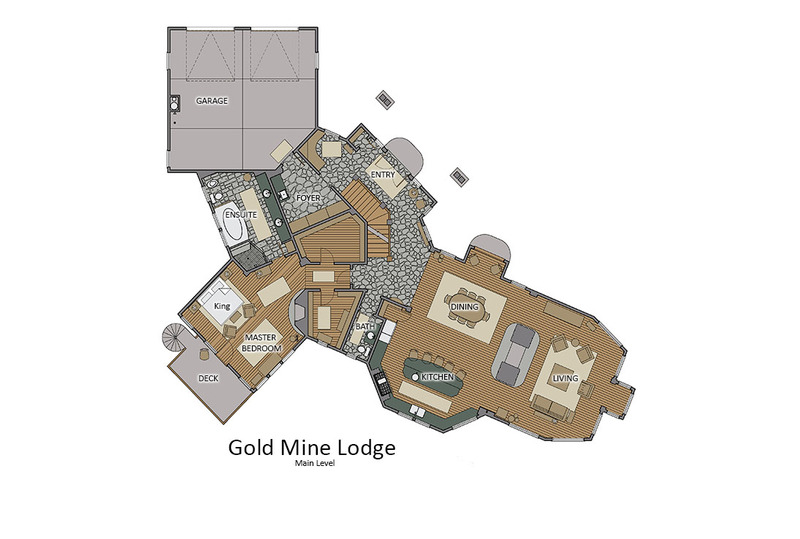 Gold Mine Lodge has everything you need for the most incredible vacation experience. Your home away from home is just steps away From the Thunderhead ski lift. At the end of the day you’ll return to one of Steamboat’s most luxurious homes crafted and accented with timbers from an Oregon gold mine. No expense has been spared to provide the highest level of comfort. This magnificent on-mountain home represents the very finest in luxury home design. Located just a short 150 yard walk from the Thunderhead Lift, you have everything you could ever want or need in a ski home. 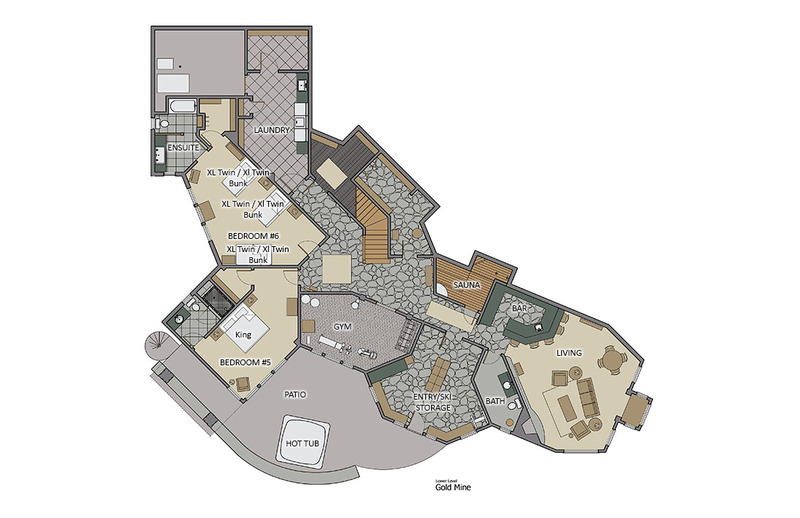 It boasts a smart and spacious floor plan with an abundance of windows and outdoor spaces. Almost every room has a view to the ski hill or the valley. Everywhere you find little details that make this home unique and authentic, unlike anywhere else you will ever stay. As you enter the impressive entry you will be drawn to the spectacular stone wood burning fireplace that separates the living room, dining room, and gourmet kitchen. The kitchen, with views of the ski mountain from every window, is a delight for any chef. It is fully equipped Wolf and Subzero appliances, along with granite countertops, custom cabinetry, and a built in espresso machine. There is a breakfast bar that seats 5 and a lovely window seat to watch skiers and sunsets. The dining room, adjacent to the kitchen, comfortably seats 10. While sharing your adventures over dinner you’ll be able to enjoy the views and take in the warmth of the wood fireplace. When you are ready to retire for the evening any one of the 6 bedrooms makes for the perfect sanctuary. The main floor master bedroom has its own seating area, gas fireplace, balcony, and ensuite bathroom that includes a large walk in shower and large tub to relax in. Children of any age will enjoy the large lower level bunk room with 3 sets of twin bunk beds and private bathroom. The lower level also has a King ensuite bedroom with views of Mt Werner and Thunderhead lift. The upper level has three spacious bedrooms with queen beds, ensuite bathrooms, and private gas fireplaces. One also has a private balcony. The upper level also includes a private office with a gas fireplace. Never miss a beat with this quiet getaway to read or catch up on business emails. The exceptional features of this home also include the media room on the lower level complete with a rustic bar. The private outdoor hot tub and indoor sauna will sooth and rejuvenate tired muscles. The fully equipped exercise room will allow you to maintain your workout schedule. The truly custom ski room provides easy storage for skis and snowboards with boot dryers and work benches for keeping everything in tip top shape. Our on-call shuttle service also picks up from the door providing easy access to the lower mountain and downtown, eliminating the need for rental cars. We had an excellent time during our stay at the Gold Mine Lodge. The house exceeded our expectations and Moving Mountains was extremely responsive and helpful. We would definitely stay again! We decided to have a family reunion in Steamboat and I was put in charge of organizing it. After a little discussion with my wife, I decided to call Moving Mountains and see how they could help. From the beginning, the MM staff was helpful and had an answer for every question. We stayed at the Goldmine Lodge and utilized the private chef, grocery option and concierge service to the max. The house was out of this world with fantastic views, plenty of room for everyone and everything we needed to have a great family experience...we loved it. What a great trip and thank you Moving Mountains for making the family gathering special. We will be back! !